IRC MYTHOS XC (TUBELESS) 26X2.25, E-Walker! IRC developed the new concept of 26inch tubeless ready to be equipped with the micro-gauge inner seal system. With this system the MYTHOS XC 26inch Tubeless Ready is not only improving air seal tightness, but also reducing the tire weight compared to normal UST tubeless tires. Compact and lightweight knobs enable riders to obtain stable handling and improve controllability. IRC Tubeless Ready tire must be used in combination with an UST compatible tubeless rim and IRC tire sealant. Lighter and Smaller blocks, without losing riding performances. From center and shoulder parts are constructed with 2 levels of small blocks for weight saving without losing durability and ware resistance. Both center and shoulder blocks has similar hight, but side blocks are set little higher than other blocks for fast, light-feel ride, and high cornering grip. 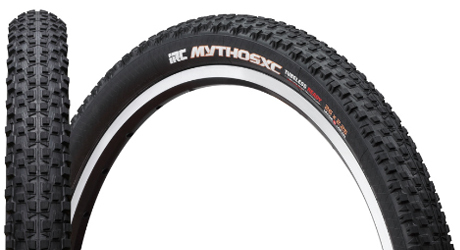 Mythos XC is light weight XC tire but has high grip and also high anti-punture resistance. These Triangles aren't just for decorations. These low profiled triangles are perposed for anti slip, and also provides cut resistance. Most other conventional tubeless ready tires doesn't have air seal layer on the inner wall of the tire, but IRC insures better air seal with applying thin air seal layer on inner wall of the tire. That's why IRC's tubeless ready tire is able to inflated without using air compresser most of the time.